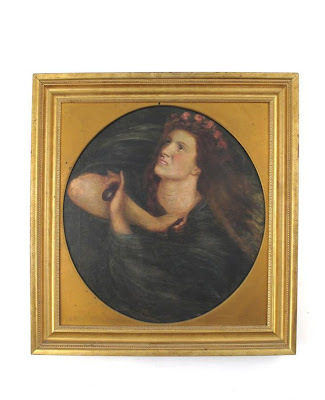 A very nice auction from Woolley and Wallis. Some lovely pottery and some tiles, including by de Morgan, I would personally love. 'La Castagnetta' an oil on canvas by Dante Gabriel Rossetti (1828-1882), framed image 41 x 38cm. Virginia Surtees The Paintings and Drawings of Dante Gabriel Rossetti (1828-1882), A Catalogue Raisonne, 1971, page 93 catalogue number 166.